He shops he scores an Empire Strikes Back Action Figure Set with nine figures. Actually, my non-geek but super cool wife scores. It is great to have a spouse who isn't a geek or a collector, but knows what I like and the condition items should be in. While my wife was out making her weekly Target run she noticed the Empire Strikes Back Action Figure Set in the clearance section and immediately called me. I had known that the set was an exclusive for the bulls eye branded store last year, but really didn't want to spend $50 for it, which really isn't a bad deal since it comes with 9 action figures. But for $25 it is for sure well worth. They were on sale for 50% off. Sweet. However, my wife immediately noticed that the packages weren't in the best shape. Even for half off she knew how particular I would be about the packaging so she texted me and sent me pics. Based on the pics she sent, I declined the ever so sweet thought of my wife picking up this piece for her geek husband. The next day however, we went to another Target and what do you know. They had them on clearance there too. However, this other store had them in the 30% off section. Not as cool as 50%. I decided to inspect the packages anyway and found the same creased package problem the other action figure sets had at the other store. Save one. A sister planet...Cmdr Adama original BSG(sorry to much sci-fi dialogue in me head). The thing is, this one was in very good condition. Not only that, it was the only one marked down half off. The collecting gods had shined down on me. There were six other packs of three figures each in the vintage line. It would have been cool if Hasbro had done them all, but that might be a bit much. Anyway I am way happy on my find. 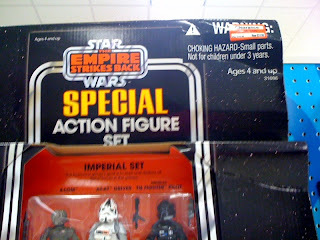 If only I could have found the Target exclusive vintage TIE Fighter and Rebel Armored Snowspeeder on clearance too.